Lonsdale House, pictured in early February. Check the tower. Isn’t that great? Here’s how the site looks now it’s gone. But it does seem a shame that at least the facade couldn’t have been kept with the new development — which is to be a shrine to Steve Jobs. That’s right, it’s being replaced by an Apple store and yet more shops. A shame. I think the Americans call in “progress”. Not seen Lonsdale House from that angle, thanks. I won’t start a rant about a certain minister. It has improved the view of those other buildings. That sounds stupid because the tower is good looking. Melbourne Central should have expanded to another level for the Mapple Shop and more shopaholics. Me again. The picture of the Mapple Shop looks good but the Mapple shop should go to Docklands. There is heaps of land there. That mapple shop looks like the one in America. All I notice is the grafitti. wow, never seen that building in the background before! Maybe the Apple dudes will construct a place with an art deco feel, but alas I doubt that. 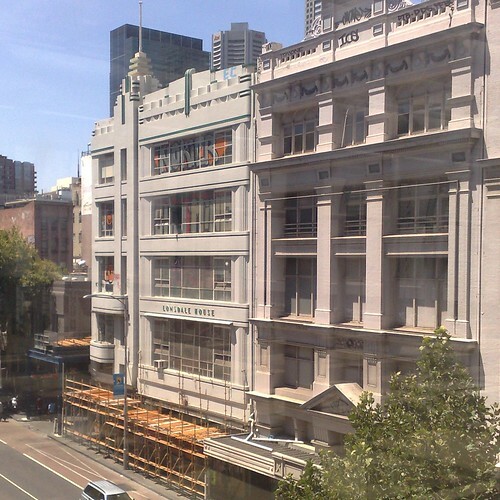 That’s exactly what that noted architectural expert Robert Doyle said as part of his justification for the City of Melbourne’s gutless performance in supporting the demolition of this building. Of course it was a REAL deco building – not just a facade attached. The entire fabric of the buildings (2 connected) was re-modelled in 1934 – new layout inside, new materials used and a skilful management of the different floor levels of the two buildings that was reflected in the design of the facades, particularly at the bottom two levels. Appears that your skills are better suited to transport than architecture!! A shameful day for the Minister, the Council, Colonial First Sate, so-called ‘heritage architects’ and the retail sector. BTW it is not just an Apple store that will go there – according to Colonial’s lawyers, it will be a “Hero Statement”! 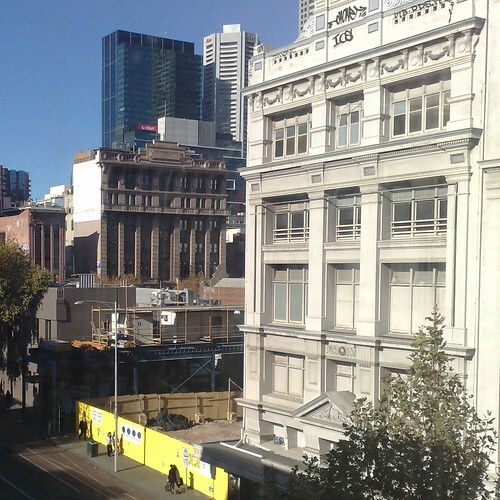 @Andrew, the pics were taken from the bridge between Myer and Melbourne Central. @Robin, many thanks for that information – very interesting. I assumed what I’d heard was right – it obviously wasn’t. Bout time they knocked something down for an Apple store, I need somewhere else to go salivate over the latest gadgetry. Great, just what we need – pull down something decent and put up more crap from architects. I bet it will be all glass at the front! It will be like the rubbish that passes for public utility in Melbourne (& just about every other western city) these days. It is summed up best by Southern Cross station which is all about impressing people in office towers looking down (who never use the station) as well as the architects (who never use the station) getting meaningless international awards and toasted by the legions of BMW drivers of the Eastern suburbs. Whereas the users are inflicted with a station that fails to deal with a storm, no decent cover at the Bourke street pedestrian bridge end, complete lack of clear platform indicators at the mezzanine level, diesel fumes, etc etc.